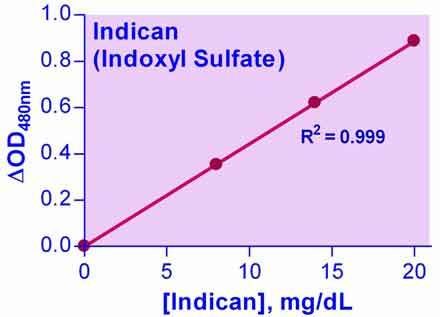 • For quantitative determination of indican (indoxyl sulfate) in urine samples. • Fast and sensitive. Linear detection range: 0.2 - 20 mg/dL (8-800 μmoles/L). • Fast and high-throughput. Homogeneous "mix-incubate-measure" type assay. Assay takes only 10 min. Can be readily automated for processing thousands of samples per day. • Indican (indoxyl sulfate) is a putrefaction product resulting from bacterial deconjugation of dietary tryptophan to indole in the small intestine. A large body of evidence supports the use of urinary indican testing as a beneficial point-of-care screening tool for dysbiosis, small intestinal bacterial overgrowth (SIBO), constipation, malabsorption, intestinal mucosal permeability etc. Common microorganisms that contribute to positive indican tests include Salmonella, Shigella, Campylobacter jejuni, yersinia enterocolitica, Citrobacter freundi, Citrobacter diversus, Klebsiella pneumoniae, Pseudomonas aeruginosa, certain strains of Escherichia coli, Staphyloccocus aureus, some strains of bacteriodes, Clostridium difficile, Candida albicans, other candida species etc. Traditional Indican test using Obermayer?s reagent gives only qualitative results. BioAssay Systems quantitative indican assay kit is based on an improved Curzon and Walsh method. In this assay, indican reacts with a chromogen. The color intensity of the product at 480nm is directly proportional to the indican concentration in the sample.